Odour due to Volatile Organic Compounds (V.O.C. 's) add to unacceptable air polution and smog outside, as well as affecting personal health and well-being indoors. 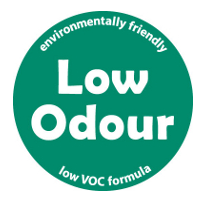 Hence our products are Low VOC and LOW ODOUR and all of our products have this sticker placed on them to show this. Seventy one years ago Duralex realised this hazard, as mentioned in our "Historical Background" leaflet. "In those days almost every surface coating contained organic solvents of some kind, white lead and red lead were the norm and Duralex figured there had to be a better way". Yes, it may be hard to believe, but Duralex paved the way to dramatically improve Surface Coatings Industry standards. Our products through the nearly 71 years of our existence have always been "Low V.O.C." and "Low Odour". We respectfully ask is there any other paint company in Australia that can say that? Duralex is committed to protecting the environment by only selecting recyclable packaging where possible and reducing its used of new packaging materials. Where possible packaging materials are collected and reused. If you are not serviced by a Duralex Rep, a carton can help keep paint stable in your customers car and will generally end up in their paper recycling bin too! These days with the importance on Caring for the Planet, the emphasis is on Eco-Friendly practices. Duralex Paints have in fact been following these principles since the inception of the company in 1946. Please protect our planet. For clean up and disposal instructions please click here.